Small MNH St. Lucia Collection On Scott Album Pages (1980-81) - SEE!!! Images below show. ENTIRE collection. I am very reasonable and am sure we can work anything out. MNH S/S ST LUCIA CATHOLIC CHURCH, MICOUD. 150th Anniversary. Abolition of Slavery. SAINT LUCIA. Scott #707. 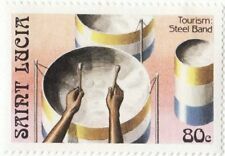 Tourism : Steel Band. SAINT LUCIA. Scott #864. 150th Anniversary. Abolition of Slavery. SAINT LUCIA. Scott #706. Very Fine Mint Never Hinged. We tried. We stand by our material. That's what we do and we think it's a good idea. We're 2 retired collectors who do this for fun. We don't make any profit on this, but we can't afford to lose money either. Topic - "12c -FISHING BOATS, SOUFRIERE BAY & QUEEN ELIZABETH II". Royalty - Queens - Boats - Fishing. SCOTT #189. Very Fine Condition & Centering. Mint Very Lightly Hinged - Original Gum. Issued 1964. 150th Anniversary. Abolition of Slavery. Scott #709. SAINT LUCIA. Very Fine Condition & Centering. Mint Lightly Hinged - Original Gum. Issued 1916. Topic - "1p -WAR STAMP - KING GEORGE V". (1 STAMP - COMPLETE). St Lucia, Sc #516-19, MNH, 1980, Olympics, Moscow, Cpl Set. Topic - "1c -QUEEN ELIZABETH II". SCOTT #182. Very Fine Condition & Centering. Mint Very Lightly Hinged - Original Gum. Issued 1964. Royalty - Queens. Topic - "8c -QUEEN ELIZABETH II". SCOTT #187. Very Fine Condition & Centering. Mint Very Lightly Hinged - Original Gum. Issued 1964. Royalty - Queens. Topic - "4c -QUEEN ELIZABETH II". SCOTT #184. Very Fine Condition & Centering. Mint Very Lightly Hinged - Original Gum. Issued 1964. Royalty - Queens. 150th Anniversary. Abolition of Slavery. SAINT LUCIA. Scott #708. Very Fine Condition & Centering. Mint Never Hinged. Issued 1980. Perforation 14. St Lucia, Sc #774-77, MNH, 1985, Trains, Locomotives, Cpl Set. SAINT LUCIA. Scott #793. MNH stamp from International Youth Year. SAINT LUCIA. Scott #792. MNH stamp from International Youth Year. Scott #791. SAINT LUCIA. MNH stamp from International Youth Year. SAINT LUCIA. Scott #794. 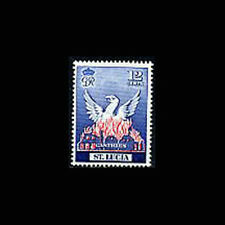 MNH stamp from . St Lucia, Sc #546, MNH, 1981, S/S, Royal Coach, Coachman. Tourism : Limbo Dancer. SAINT LUCIA. Scott #865. Tourism : Chak-Chak Band. SAINT LUCIA. Scott #862. MNH (Mint Never Hinged). MLH (Mint Lightly Hinged). Used – Cancelled. Pencil # (Pencil writing on reverse of stamp, usually catalog number &/or price). Rem or Remnant (Paper or Hinge Remnant on reverse of stamp). 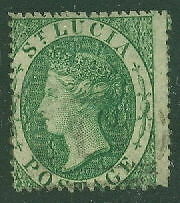 St Lucia, Sc #543-45, with tab, MNH, 1981, Royalty, Diana, Charles, Cpl Set. 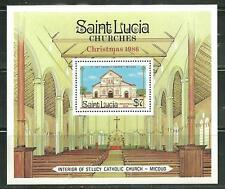 St Lucia, Sc #871, MNH, 1986, S/S, Churches. St Lucia, Sc #594, MNH, 1982, S/S, Royalty, Diana. 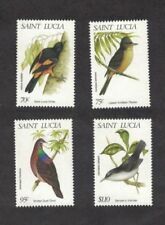 St Lucia, Sc #731-34, MNH, 1985, Butterflies, Insects, Cpl Set.